A bookophone consists of a paperback book and a rod/pipe 'activator bow' of some description. 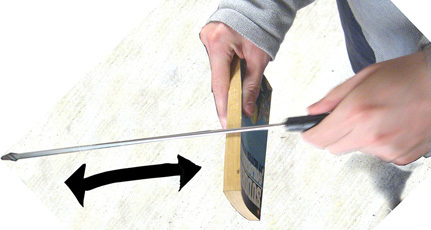 The rod can be metal, plastic or lacquered wood, and it is drawn perpendicularly across the book's textblock in a bowing action. It produces acoustic pseudo-shepard tones and, with some practice, a variety of barks and yelps can be produced. 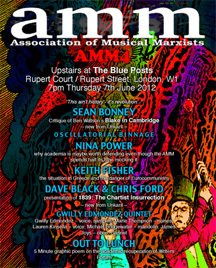 The AMM event was one of the more off-the-wall performances of recent memory. The two new books being discussed that night were Ben Watson's Blake in Cambridge, and 1839: The Chartist Insurrection by David Black and Chris Ford, both books published by Unkant. (Tangentially, whilst setting up the space, Ben Watson found convenience in my bookophone's 'activator bow' in liberating from the ceiling the Union Jack bunting left over from a Queen's Jubilee celebration some days earlier). Interestingly, Watson chose to launch his own book by giving a platform to its critics who proceeded to denounce various aspects of its content, creating much debate (which also encompassed ventings on AMM's anti-academic stance). Watson - an expert in language-defying tone poetry and mega-freeform vocalistics - then encouraged Oscillatorial Binnage to acoustically ornament/mimic the ensuing debate, which was already agitated by Watson's occasional divergences into his hyperconfusing wordjazz. 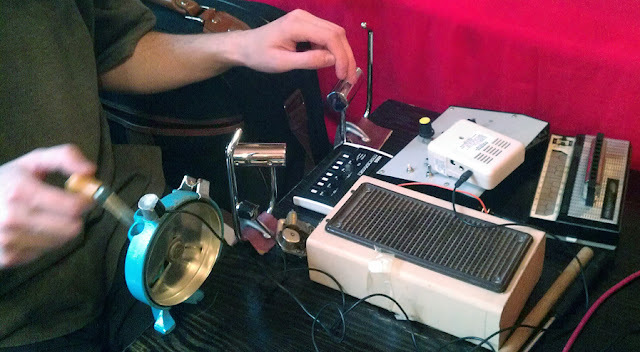 Electronics, crackleboxes, bean slicer, clarinet, squeaky toilet paper holder combo, harmonica and bookophone (among other things - mostly stuff found in bins) culminated in a noisome uproar. Regretfully, some of the younger people present did not at all enjoy the ultra-high pitched amplified blasts. (All recordings can be heard here). To change the subject slightly.... My shoes are always broken. Earlier that rainy, rainy day, I had been in the second-hand book basement of a King's Cross bookshop, trying to identify a louder £1 book for bookophone implementation (without actually compromising the shop's stock by bowing the book edges). Owing to a hole in my shoe, rainwater had made ingress to my sock, making an unpleasantly wet foot; an irritating feeling which distracted me and so impaired bookophonic sonic book judgement. Abandoning the search, inspiration made me hop to the British Library where strong plastic bags can be obtained - most convenient! There, I made myself a plastic sock to place inside my shoe thereby offering protection against the rainwater. This provided comfort, not just for the rest of the day, but for the next week too. [Such a feet/feat of necessity is perhaps worthy of Vladimir Arkhipov's attention: specifically his Home Made series of books cataloging folk artefacts borne of such necessity]. However, by the time the AMM book launch began, the plastic sock had started to smell really bad. There's an esoteric quirk of hygiene that sees unventilated feet turn odorous. 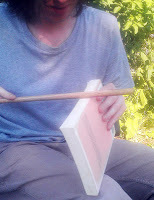 Yet by the unpremeditated combining of the bookophone sounds with the 'British Library bag-sock' footsmell generator, I had fused both scent and sound into a new emission-sensation. However, the other members of Oscillatorial Binnage were undecided and mildly dismissive of it. I did wonder what the academics and anti-academics would make of this multi-faceted concept-fusion of bookophonics, British Library bag-socks, bad odour twinned with questionable bookwhine sonics... It is probably too irrelevant or 'lumpenproletarianesque' to even contemplate. Not since the heady days of The Exciting Hellebore Shew have I seen such magisterial gonzo-improv journalism, its utter subjectivism providing a more reliable guide to reality than any amount of "authoritative judgment" from experts. I was always jealous that Chris Weaver (who engineered both our shows on Resonance - yours succeeded my Late Lunch With Out To Lunch didn't it) decided to form a band with you rather than me (oh, I know why, I'm not a musician). So this gig together was a dream come true. Profoundest thanks, Ben! It was an absolutely remarkable evening, hence these extended remarks. Really well done. It's also gladdening to hear that the subjectivism is palatable - I have often had sudden doubts about this, you see. Incidentally, originally billed as just 'The Hellebore Shew', it was after first hearing 'Late Lunch with Out to Lunch' that I persuaded Knut Aufermann to insert the prefix "Exciting" in the hope that the radio-excitements of your 'Out of Lunch' could be somehow artificially sustained by autosuggestion.